For anyone looking for a wholesome homemade bread that is rich in protein and super easy to make. 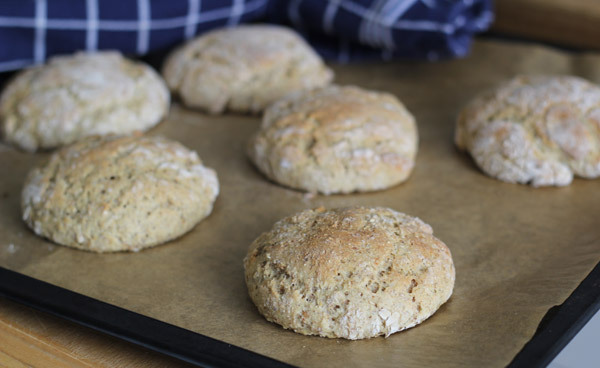 I’ve used a course rye flour for this recipe however, you can substitute the flour for other varieties that you prefer. Cook the lentils in a pot with the water for 15 minutes, including any spices. Once done, put the pot, i.e don’t drain the lentils, including the water to the side. Let cool off. Once the lentils and water has cooled off, add the lentils to a jar so that you can mix them with a hand blender into a smooth liquid. Add water so that you get 7dl of liquid in the jar or the container you use. The liquid should be 42 C (or as otherwise indicated on the packaging for the yeast you use). Mix lentils, honey/syrup and water until smooth. Add the liquid to a large bowl, add salt and oil, mix well. Add the coarse rye flour and mix well. Add 4 dl of the wheat flour and mix well. Continue to add 1 dl at a time of the wheat flour until you have a dough that does not stick to the sides of your bowl. Then cover the bowl and let the dough rest for 30 minutes. Work the dough for a minute or two with floured hands and divide into 16 pieces. If the dough is sticky add som extra what flour until it’s less sticky. Place the buns on trays, covered with baking sheets, cover the buns and let them rest for 30 minutes. Bake in a preheated over, 225 C for 10-15 minutes depending on the size of the buns.